Which social media channels are right for my business? Which social media channels you should use depends on your audience. A Facebook business page can be used to provide useful and sometimes light hearted way to personally connect to your customers. LinkedIn was made for business and is all about networking and can be used to market your business and services to the right audience. Creating engaging content to showcase your products and business will grow your network and drive leads. LinkedIn also makes it easy to target a specific audience by joining groups. Videos are so important today as a tool to engage your audience. YouTube provides free video hosting and videos can easily be embedded on your company website and other social media outlets. Twitter is where people turn for up to the minute news, information, and advice. Posting frequent updates, or Tweets, and using highly targeted hashtags can connect you with the right followers. Pinterest is all about lifestyle. If you are a manufacturer of direct to consumer goods then Pinterest may be a great platform to gather a following. If your company manufactures products for the architecture, interior design and decorating, landscape design and home improvement industries, Houzz will be a great platform for you to use. Is social media marketing worth it for my manufacturing business? Yes, it cannot be overlooked. By presenting helpful and quality content you will build trust with your clients, reinforce your messaging and ultimately your corporate brand. 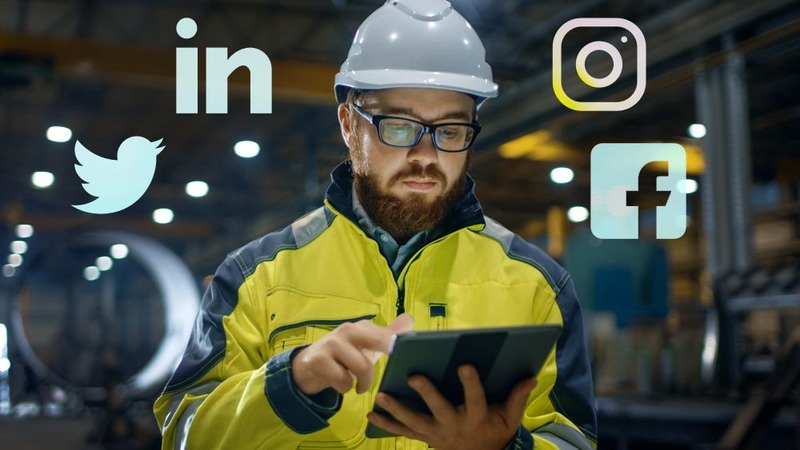 Manufacturing companies not using social media are missing out on making those important connections. What benefits will social media campaigns provide my manufacturing business? Increase Sales Leads: The objective of your social media campaigns is to drive traffic to your website or a landing page. This is where you engage your visitors and generate sales leads. Build Customer Confidence and Trust: By consistently posting quality content on social media channels you become an expert in your customers’ eyes. Increate Search Engine Rankings: Search engines love quality content and will view you as an authority in your industry and reward you with higher rankings. Network with other companies in your industry: Expand your business by opening the door to new opportunities and working with other organizations in your industry. What if I don’t have time to write the content? If you don’t have time or don’t have anyone on staff dedicated to keeping your social media accounts active, we can help. After a short discovery phase, will work with you to develop a plan to create content and a schedule that will have the most impact for your business. We also incorporate analytics so we can track progress of the campaigns and make adjustments as necessary. We love helping our manufacturing clients succeed and taking advantage of social media is one way. Let’s talk about how we can help you.